The proven most effective way to maximize the life expectancy of any building or structure is with regular maintenance. Careful cleaning at programmed intervals by Superb Pressure Washing technicians will keep your building in pristine condition. We assist retail operators and commercial property managers with maintaining the attractiveness of their properties. A clean place of business projects a professional image. Superb Pressure Washing helps to create first impressions for new customers while renewing confidence in your existing clientele. Our regular maintenance cleaning can be designed to fit any schedule. For your convenience, we offer day or night services. We schedule the work to be performed at times that will minimize interference with your business operations. Superb Pressure Washing will keep your exterior surface looking good all year round. 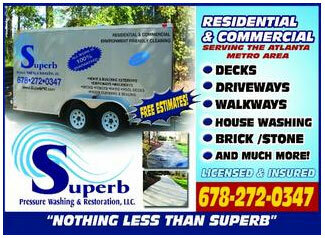 Why Use Superb Pressure Washing & Restoration, LLC? For immediate assistance call us at 678.272.0347 or contact us.